all records prior to this date are no longer attainable. Ms. Ashmore, are Daniel and Precilla Gilleland your ancestors?. intersection of FM 487 and FM 1600 in Milam County. notations for clarification of reference sources on the said pages. Attachment # 1 is just an FYI for you. If you would like the above performed promptly, I have attached all the necessary reference sources. 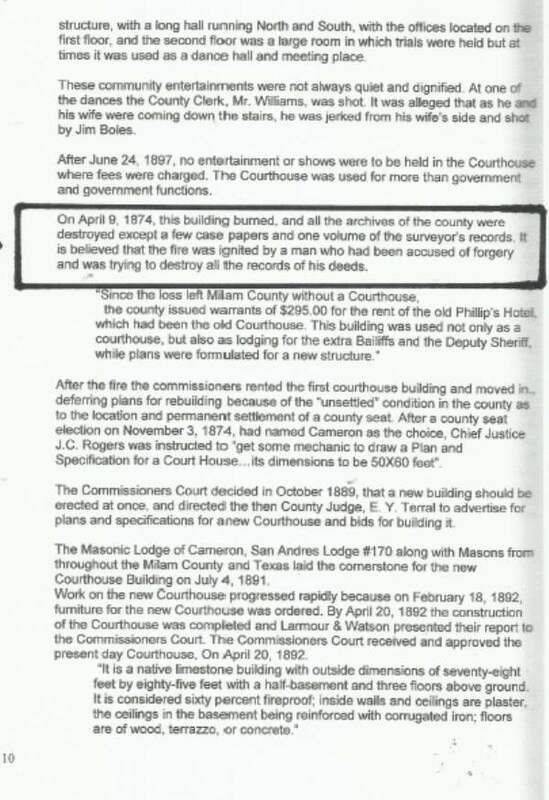 Barbara Vansa, Milam County Clerk, 107 W. Main St., Cameron, Texas 76520. Deputy Clerks are Susanne Gelner, Jodi Morgan, Linda Hall, Esther Vargas, and Linda Acosta. knowledge of the original reference source for this article, but it is reprinted in "Tales From The Museum"
Director. Mr. King was kind enough to allow its use for a previous MCHC inquiry and all credit goes to him. 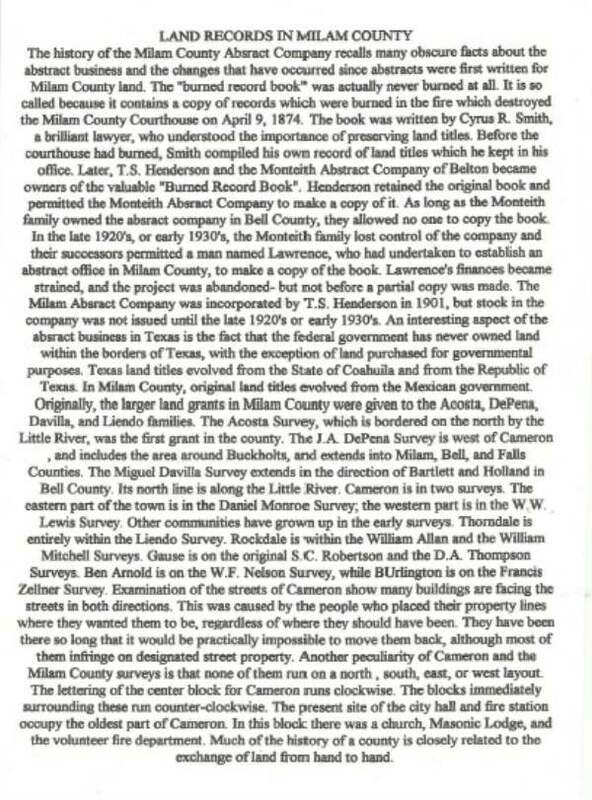 historian, that these records are now held by Botts Title Company located in Cameron and Rockdale, Texas. Among the first Anglo American settlers to come to Texas with colonizer Stephen F. Austin were Daniel (b. 1795) and Precilla Boatwright (b. 1803) Gilleland. They were members of Austin's Old Three Hundred colony. 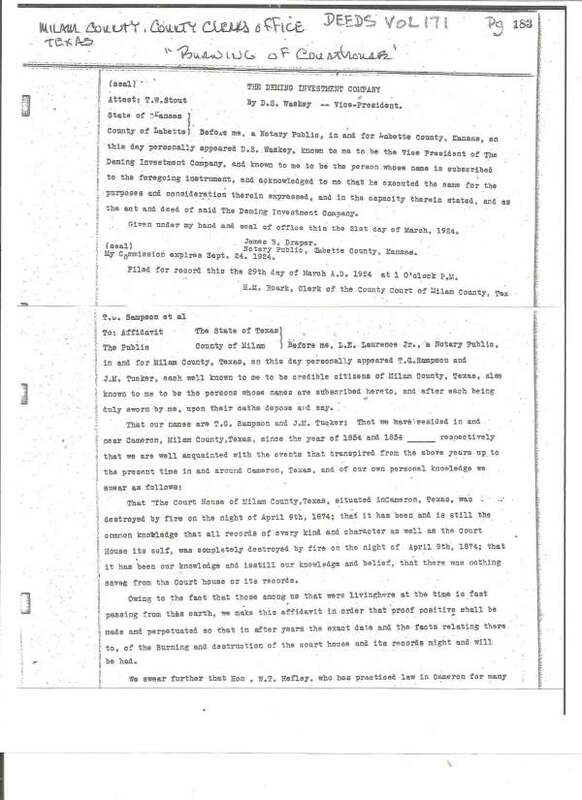 Daniel Gilleland received land grants in what is today Colorado and Austin counties. Montgomery counties. 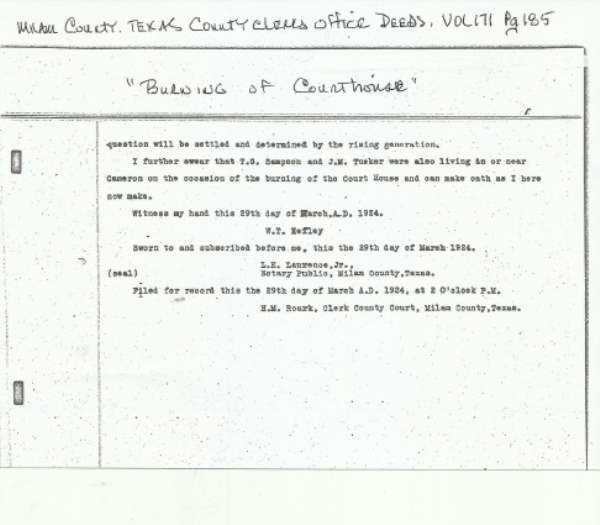 By 1847 they had settled in present Milam County. served in the Confederate army. 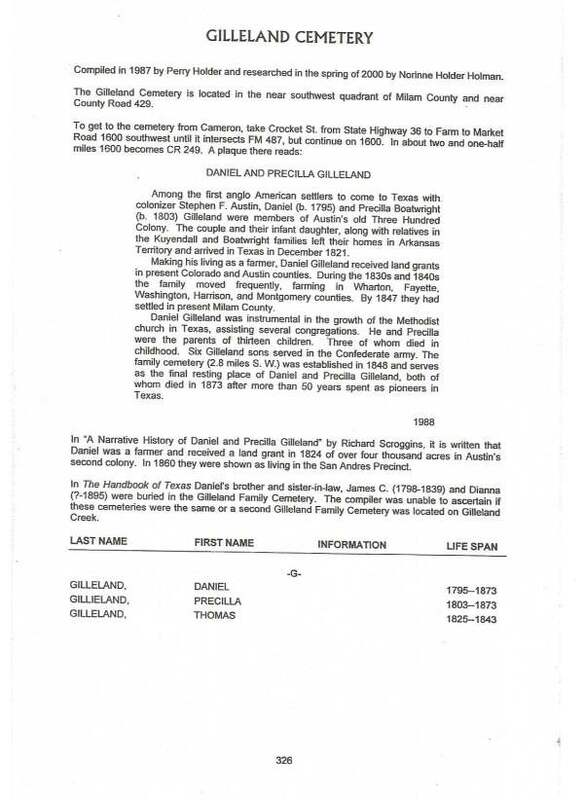 Precilla Gilleland, both of whom died in 1873 after more than 50 years spent as pioneers in Texas. remaining records in two slim volumes. grandfather, Felix Grundy, and my great, great-grandfather, Daniel Gilleland. relatives, which has been most rewarding. Thank you for the attachments. No, they're not my relatives. My wife, Beth, grew up in the Tracy community which is about two miles northwest of the Gilleland Cemetery. a visit to the Gilleland Cemetery. 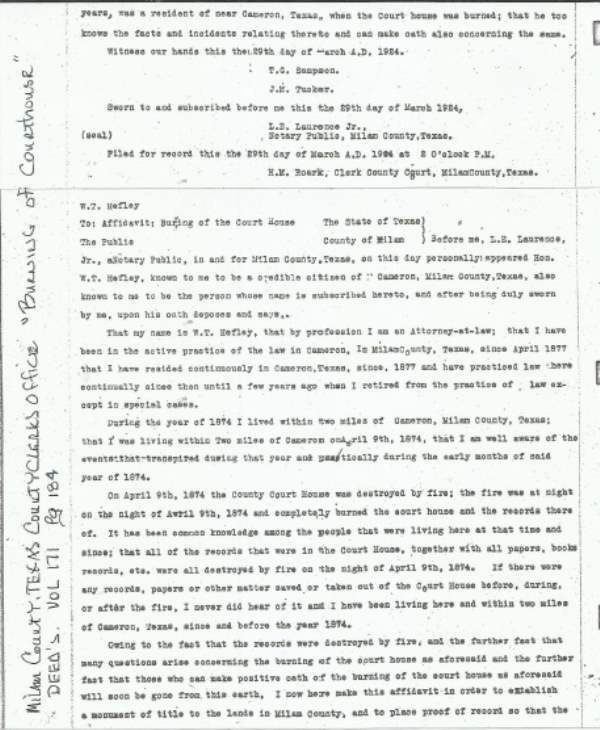 Mrs. Holman even provided an additional reference source by Richard Scroggins. (Jan.23, 1827- Jan. 7, 1852. Thank you for the information but most of all thank you for taking an interest in Texas history. So little history is allow to be taught in our public school; therefore, it is very important that adults like yourself keep history alive for future generations.